Better Homes and Gardens you will find articles on cooking healthy, gardening tips, remodeling your home, sewing, step by step instructions to home repair, articles on saving money. Buy a single copy or subscription to Better Homes and Garden magazine. The monthly publication has been around since its launch in 1922. The publication was founded by Edwin Meredith who also served as Secretary of Agriculture for the United States under President Woodrow Wilson. The magazine covers interior design, cooking, gardening, entertaining, crafts, and lifestyle issues. It is published on a monthly basis. Better Homes and Gardens is also published in Australia under license agreements.In Better Homes and Gardens you will find articles on cooking healthy, gardening tips, remodeling your home, sewing, step by step instructions to home repair, articles on saving money. 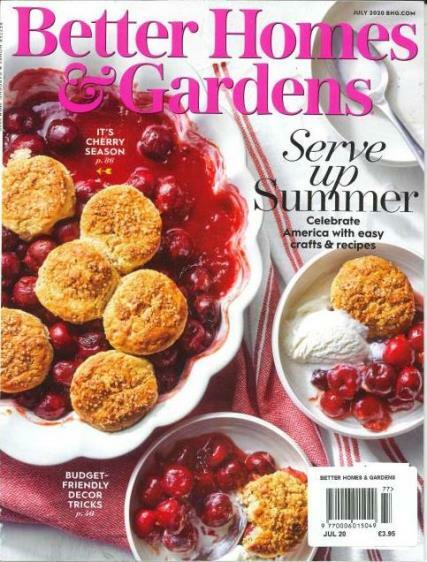 If you love home design, saving money, cooking, gardening, and entertaining, you will want a subscription to the classic women’s lifestyle magazine Better Homes and Gardens.